I was working on my 1963 Fender Bassman, when I decided to plug in my Gretsch and see if I’d wired the speakers properly. Expecting the delicious tones of the early ’60s amp, I was disappointed to hear silence. Not even a hum! I quickly shut everything down and checked all my connections. The speakers showed the proper resistance, there were no shorts, and the guitar cable was fine. Stymied, I reverted to old-school thinking. This was no digital modeling amp filled with transistors, chips and software, after all. This was a tube amp that was built before I was born—and I’m old! Looking in the back of the Bassman’s head, everything seemed fine. That is, until I removed the preamp tube covers. 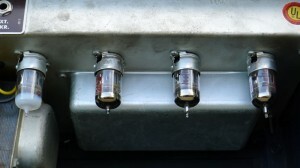 Vacuum tubes usually have a nice shiny coating on the top or called getter flash. This shiny patch is a sign that a tube has a good vacuum. Seeing as how they’re called vacuum tubes, it’ safe to assume that a good vacuum in important. I’ll spare you the technical details, but the thing to remember is, silver = good, white = bad. If you really want to know the technical details, check out How_Vacuum_Tubes_Work. They do a great job of detailing all the finer points of vacuum tube mechanics. The offending tube was in the inverter position in this amp, which is why it was silent. Talk about your single points of failure! Anyway, I did what any seasoned tube amp snob would do—I got some oven mitts and gently pulled the ugly tube out. The now white-flashed tube popped out along with some other bits, which I must say, was slightly unsettling. I’ve been using tube amps for a long time, and spare bits falling from tube sockets is never a good thing. Careful examination of the tube showed what could be described as a slight vacuum seal failure. That, in and of itself, was not a big deal, since I could just replace the tube. 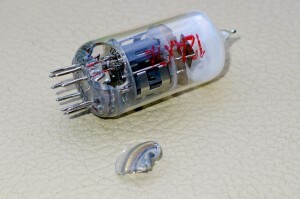 What sucked was the fact that this was a relatively rare New Old Stock (NOS) chinese 12AX7 preamp tube. I had hunted for months trying to find these, and I paid a premium for them. 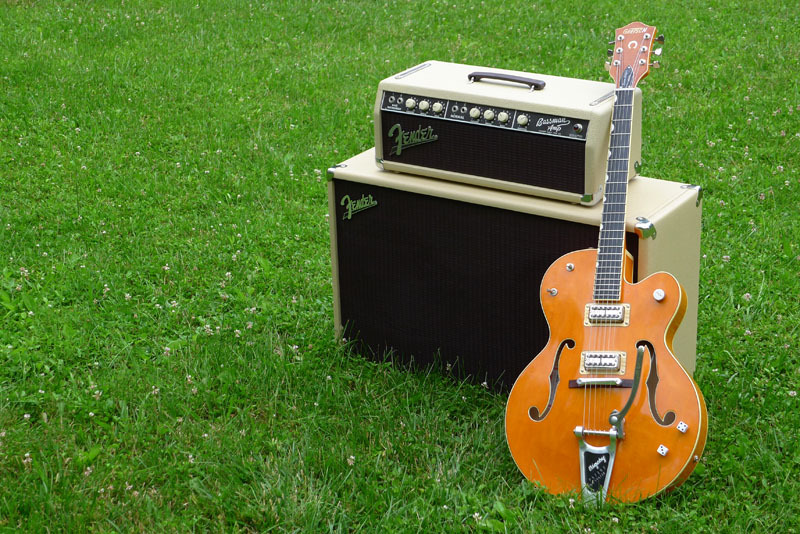 They are the preamp tube of choice when chasing Brian Setzer’s tone. So how did this happen? About a month prior, the amp head had fallen about a foot onto pavement. At the time, I fired up the amp and it worked fine. Relieved, I packed it back up and went about my business. My guess is that the impact caused a fracture that, over time, turned into the catastrophic vacuum failure you see here. The lesson here is that you should not routinely slam your vintage tube amps on asphalt. There are delicate glass bottles inside which prefer to remain devoid of air. It would seem that these little chinese tubes weren’t designed to handle such abuse. Contrast those chinese tubes with the NOS American-made Tung Sol 5881 power tubes. Those tubes were designed to be used in B-52 bombers. They appear to be fine, though I must still advise that against dumping them on pavment. The lesson here is that you should not routinely slam your vintage tube amps on asphalt. lol. So did you go back to find the same rare preamp tubes or go with the ruby 12ax7a-c5? Some people actually prefer the Rubies, so if you can manage to try them both, I encourage some tube rolling.